Why not try something new for the New Year? Here is a healthy meal using savory Moroccan spices to kick up your dinner on a cold January day. Heat oven to 425° F. On a rimmed baking sheet, toss the chicken with the cumin, paprika, 1 tablespoon of the oil, ½ teaspoon salt, and ¼ teaspoon pepper. On a second rimmed baking sheet, toss the beets with the remaining 2 tablespoons of oil and ¼ teaspoon each salt and pepper. Roast, tossing the beets once, until the beets are tender and the chicken is cooked through, 30 to 35 minutes. Meanwhile, cook the couscous according to the package directions. In a small bowl, whisk together the yogurt, lime juice, and cilantro. 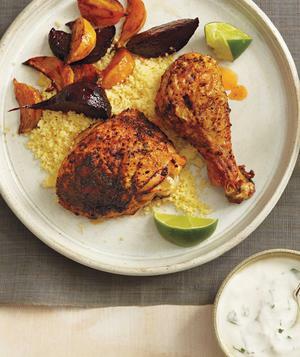 Serve the chicken with the couscous, beets, yogurt sauce, and lime wedges.